Moving from a love of Geometry at school, I became fascinated with angles and space. What is perfect balance? The line AB is divided at point M so that the ratio of the two parts, the smaller MB to the larger AM is the same as the ratio of the larger part AM to the whole AB. (phi). This is something we do naturally, rather like tying the ribbon on a parcel. The subject of the Golden Section and Fibonacci numbers (divisions 1,2,3,5,8,13) is vast and I do not want to go into that now. Suffice to say that this breakdown of space happens naturally in nature, in the spiral of a shell, leaves on a branch, petals in a flower and also in the great artists' paintings such as Leonardo de Vinci and in music. Working with geometry and with a fascination for lines and space, I created a series of one off pieces, using the screen as an art tool with masking and painting. My challenge was to leave large areas of pure white, or to print huge areas of flat colour, something a commercial printer would not do because of the high risk of uneven 'backs'. A commercial printer would only print an area not larger than 5" x 5". 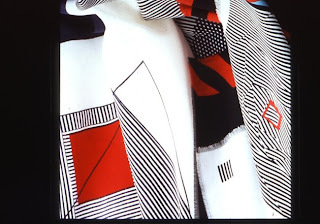 'Optical' Collection of silk scarves. 1. 'Rooftops' One design of nine from drawings in the snow. 2. 'Princess Nouchi'. silk scarf, hand printed and painted. For the Royal Society of Arts National Bursary Award, I submitted four boards of drawings and design ideas. This was the final piece. I was selected as joint overall winner.